Download and print over a dozen sight word worksheets to build reading fluency. Words for this week include: an, for, it, to, and girl. Here is the sight word list for unit 5. There is a take-home activity kids can do with their parents to practice their sight words. For this activity, students use their scissors to cut apart the letter tiles. Then they'll glue them together to make five different sight words. In this printable sight word activity, students will read the sight words, trace each sight word, and write each sight word. Students will trace each sight word two times. Students will practice their handwriting and their sight words using this printable activity. Carefully cut out the words girl, my, dog, can, can and see. 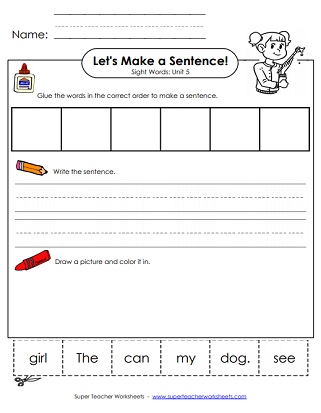 Attach them to the worksheet to build the sentence, "The girl can see my dog." You can use this activity during learning center time. Students use ink letter stampers to make sight words. 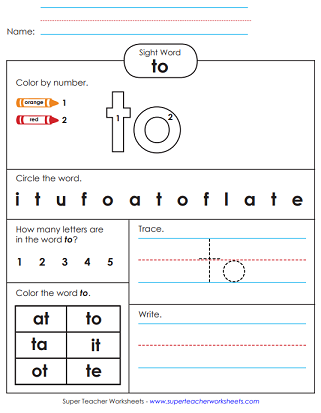 This worksheet is great for take-home practice for your students to review their sight words. Color the letters in the word an. Then trace the word and write it on your own. At the bottom of the page, fill in the word to complete the sentence: "This is an apple." Cut out the letters r-f-o and arrange them to make the word for. Also practice writing and tracing the word. Trace, color, and write the word. Then complete the sentence and draw a picture. Complete the color-by-number with the letters t-o. Then write, trace, and color the word to. Students will use pencils, crayons, scissors, and a glue stick to complete this worksheet. Cut out the picture of the airplane and the letter strip. Weave the strip through the middle of the plane. Slide the strip up and down to make words. (If you'd prefer a color version of this slider, click on the ALT button below.) Print on card stock paper for best results. Cut out these flash cards to practice this week's sight words. Students can practice on their own or in a group. Cut out these words to use on your word wall or pocket chart in your classroom. This allows students to see their sight words during class. Teachers can assess students' ability to read Unit 5 sight words. This page has two assessment forms. 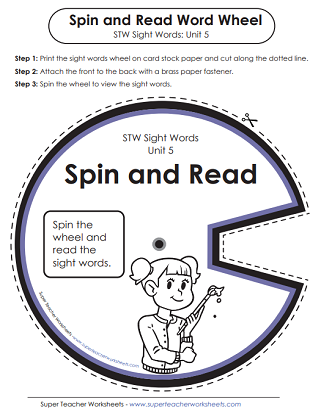 Test your students' ability to read this week's sight words with this printable assessment tool. If you're in search of a master list of all sight words in units 1 through 30,k this is the file for you. Next week's words are: has, her, are, him, and boy. From this page you can link to any of STW's thirty sight word units.